As one can imagine, a metal tower 300m high in the heart of Paris does not fail to disturb the natural environment of the capital. If most natural phenomena related to the presence of the Eiffel Tower are not noticeable, this is not always the case. This page lists some of these phenomena and explains their causes and effects. 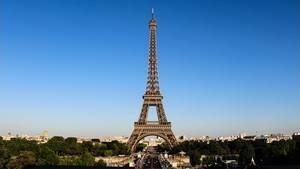 Although it is metal, the Eiffel Tower oscillates on its base, but of course it is only the summit which undergoes the consequences, it moves slightly in one direction or another. There may be several causes for this phenomenon, but only two have importance: The temperature, which expands the metal, and the wind, which offers a horizontal force. The other causes are perfectly negligible: difference in atmospheric pressure, efforts due to vertical winds, disturbances due to the visitors of the tower, all of which would be massed on one side, etc. All that does not count in moving the top of the Eiffel Tower. On the other hand, the temperature and the wind, yes. The following file explains the methods of measuring the summit, at a time when the technology we know today does not exist, and gives the results observed with their conclusions. To summarize, we can say that the Eiffel Tower has a summit that moves on the one hand an ellipse of 10cm by 4 because of the wind, but that violent gusts of wind causes almost no movement, it is the fact to have a steady wind that makes it move, and on the other hand that it moves in a curve that flees the Sun up to 7cm. It is normal that the turn "flees the Sun", because the sunny side expands, the crossbowmen grow and push back those of the opposite face, the top and then pulled towards the shaded part. Following the curve of the summit in sunny weather, there is a displacement that can go up to 24 cm, but without moving more than 7 cm from its midpoint. These explanations are therefore available here: Oscillations of the top of the Eiffel Tower. What are the results of observations on atmospheric electricity at the summit. These explanations are available here: Effects of lightning the Eiffel Tower. What happens in our body when we go up, and incidentally goes down, the Eiffel Tower? This is the question posed by Dr. Hénocque in the late nineteenth century. His study focused on various parameters of the human body such as tension, muscular effort, heart rate, he has come to understand the effects of the effort necessary to the rise, their evolutions over time. It must be said that this is the first time that one could measure in Paris these effects. And in this regard, the study focused on the rise of more than 1700 steps, which corresponds to the 3rd floor! And yes, at that time it was still possible to climb the entire tower on foot, which is no longer possible today, except security system, of course. In the link below is all his study, taken from the book "The Tower of 300m", by Gustave Eiffel. Detail of the study: Physiological effects of the rise.